We’d love your help. Let us know what’s wrong with this preview of West Like Lightning by Jim DeFelice. To ask other readers questions about West Like Lightning, please sign up. The Pony Express existed for eighteen months on the eve of the Civil War. From its first month when riders carried the news of Lincoln's electoral victory, to its demise, news was carried from St. Joseph Missouri, the western edge of the civilized world, to Sacramento and stations in between. DeFelice weaves the facts and myths of the Pony Express with the events of the time. The election of Lincoln, the dissolution of the union, indian wars, the Mormon or Utah War, the gold rush as well as the i The Pony Express existed for eighteen months on the eve of the Civil War. From its first month when riders carried the news of Lincoln's electoral victory, to its demise, news was carried from St. Joseph Missouri, the western edge of the civilized world, to Sacramento and stations in between. DeFelice weaves the facts and myths of the Pony Express with the events of the time. The election of Lincoln, the dissolution of the union, indian wars, the Mormon or Utah War, the gold rush as well as the inception of American Express (although not the credit card) and the telegraph and railway. Many historical characters are also part of the story: Buffalo Bill Cody, Jack Slade, Wild Bill Hickok, Kit Carson, John Fremont, Mark Twain, George Custer, James Buchanan. Ned Buntline helped promote the thrill of the wild west in the many books he authored and by organizing the traveling wild west shows of Bill Cody. The movie The Revenant was based on the life of Jim Bridger, a mountain man who survived many near death experiences. West Like Lightning is a meticulously documented account of the time. Some of the details were over-whelming and the events were fragmented. That said, it was nice to read the concurrent news of the day. America has had a love of the wild west myth as well as that which is factual. DeFelice often indicates that many legends cannot be proven. Why does it continue to fascinate us? The author believes, "The values of the service itself: dependability against all odds, unflagging commitment to a mission -these are values we too want to emulate." We all need heroes. Listened to the audio. Reader is perfect for this topic. The author offers an expansive history of the Pony Express contextualizing it within its time. There are often many side tangents, but I found these to be more fun than engaging. The author’s humor also prevails throughout ultimately making this a great, accessible book not just of the narrow topic of the Pony, but of the Old West, and America. DON'T FORGET TO READ THE SOURCE MATERIAL AT THE END OF THE BOOK!! To me, this story is more an historical survey of the western US around the time of the Pony Express than a complete, thorough telling of the Pony Express story per se. I understand it's impossible to tell the PE story without including all the context of what was happening in and around the area and across the US at this time. Still, I found some of the diversions from the main story a little annoying at times, i.e., a distraction DON'T FORGET TO READ THE SOURCE MATERIAL AT THE END OF THE BOOK!! To me, this story is more an historical survey of the western US around the time of the Pony Express than a complete, thorough telling of the Pony Express story per se. I understand it's impossible to tell the PE story without including all the context of what was happening in and around the area and across the US at this time. Still, I found some of the diversions from the main story a little annoying at times, i.e., a distraction that didn't seem to add to the main narrative; some of the tangents seemed to be more about filling pages to make a thicker volume than adding context or diving deeper into the story of the PE itself. Here's my main gripe. If this is the 21st century's magnum opus on the Pony Express, it left me wanting a lot more of the story. In fairness, I must add that there doesn't seem to be a lot of of credible sources to flesh out the story much more than DeFelice has. Kudos to him for the extensive research, and related travel, he completed in preparing this manuscript. I strongly encourage readers like myself, obsessive-compulsive or otherwise, who finished the book wanting more, to read DeFelice's extensive, interesting and humors notes on his sources and research at the end of the book. Those pages paint a more vivid and complete picture of the challenges facing a 21st century author trying to piece together the myriad historical remnants into whole historical cloth. In truth, I think this was my favorite part of the book. I've copied down a number of the source materials he cites and will follow up with my own research. I would only rate this book as two stars, i.e., "it was OK", had I not devoured the reference material at the end of the book. That section fills in a lot of the gaps that the main narrative seems not to address. Perhaps the author did this purposefully; perhaps it was his preferred modus operandi. I think it would have been a much stronger, more interesting tale had he woven that information into the man narrative more effectively. Call me a crank if you prefer; my major complaints revolve around not appreciating the way the author chose to tell his story. There is a lot more meat on the bone at the back of the volume. If I had turned this book in as a paper for a freshman-level history class, I think it would get a B-. Maybe a B+ because all of the sources are cited correctly. A historical account specifically on the 18 months the Pony Express was in operation. The author tries to distinguish between fact and legend, pointing out details that are unsupported by the historical record. The subtitle could also be: a history of the American West and politics in the 19th century. The author covers a lot of material that seems to side track, but eventually he g .
A historical account specifically on the 18 months the Pony Express was in operation. The author tries to distinguish between fact and legend, pointing out details that are unsupported by the historical record. The subtitle could also be: a history of the American West and politics in the 19th century. The author covers a lot of material that seems to side track, but eventually he gets around to relating it to the Pony Express or it's founding partners. Fort Kearny, Nebraska territory: The story opens with a rider in November of 1860 waiting for a telegraph message on the outcome of the presidential election. The winner may determine the country's course concerning slavery, Southern secession or Civil War. The message and mail is secured in the rider's mochila (backpack), a mailbag specially fitted to the saddle. On a fleet horse the Pony man races across the Wild West, (rough country, prairie, mountains, adverse weather, wild animals, thieves and hostile Indians), on toward the new states of Oregon and California. Arriving at Fort Churchill in the Nevada territory, the telegraph lines resume from here and the message carried by the Pony man will be transmitted on to California. The Central Overland California and Pikes Peak Express Company, aka the Pony Express, aka "the Pony" was already a legend in its own time. The Pony transported mail and Telegraph messages as fast as possible. Speed made it famous: those ten days. Ten days to connect Missouri to California. From New York or Washington to the West Coast only 12 days. This was over twice as fast as the competition, (stagecoach) and months shorter then boat travel through the canal. Telegraph lines connecting the East with the new states of California and Oregon wouldn't be completed until October of 1861, the same date that saw the demise of the Pony. By 1869 the Transcontinental Railroad would also be completed. Traveling west like lightning in only 10 days was unbelievably impressive and the Pony riders became stars, celebrities fawned over and well-paid. They were athletes, young men, slim and lightweight, but rugged enough to endure endless miles on horseback, facing severe weather and life-threatening situations. Based on these hardships some believed they were underpaid. They didn't ride at an all-out Gallup, but maintained an average speed of about 8 to 10 miles an hour: a canter or trot. As their first line of defense against trouble, highwayman, wild animals, etc, they relied on horses chosen for their speed and so outran, outdistanced the threats. The author covers a variety of people and subjects related to the time period: The 1860 POTUS election and slave state controversy is presented and a biography of Abe. "...a nation divided against itself could not stand." Of the 34 states at that time, 19 had outlawed slavery. Additional controversies concerned stopping the spread of slavery into the territories and the Fugitive Slave Act. The Pony was founded by three business partners who'd operated other businesses together for some time: William Russell, Alexander Majors and William Waddell. They had success and failures in hauling freight by ox-drawn wagons, specifically for the US Army. With the outbreak of the Utah War (the Mormon Rebellion) they suffered a number of financially ruinous losses and the government refused to compensate them. Being overly ambitious one of the partners sought to monopolize the moving of people, goods and information and offset their debts. If they could win the million-dollar mail delivery contract to California, they'd be set. Wells and Fargo's American Express company and Butterfield Stage were successful competitors. The 3 partners knew the Pony Express would be a boondoggle, a money loser, but were banking on it's unprecedented popularity to help them win the lucrative mail contract. It didn't work out. The cost of paying a couple hundred riders, station operators and caring for many hundreds of horses could not be paid for by postage. The average person couldn't afford to send letters priced at $5 per half ounce (that's close to $140 today). Later when the price was lowered to $1 it was still prohibitive for the hoi polloi. Then there's the completion of the telegraph system, well a horse can't compete with the speed of electricity (by 1869 the Transcontinental Railroad would also be completed). Various Pony Express items and certain influential people included: the guns used by riders; a brief biography of Samuel Colt and the development of his iconic revolver; the Pony riders wore no uniforms, just durable frontier wear and bandanas over the face to ward off endless dust; the legacy and tales of "Wild Bill" Hickok (James Butler Hickok); the trip made by Samuel Clemens (later known as Mark Twain) to Carson City, gives his somewhat inaccurate comments on the Pony Riders. Buffalo Bill Cody wrote of his great exploits as a Pony rider, maybe the youngest ever, but they're more likely fanciful tales. He did promote the legacy of the Pony with his Wild West show reenactments. Even if he wasn't a rider, he too was a legend in his own time--talented and famous. There are many brief biographies, tales of lesser-knowns, Politics, etc such as: Jack Slade, killer and scourge, William Campbell at first rejected as a rider for being too big, 6-feet tall and 140 lbs; Sir Richard Burton a cranky Brit explorer with delightfully caustic comments on the American West and its people; Ned Buntline the prodigious Western dime novelist; Joseph Smith and his Mormons; Elijah "Nick" Wilson the White Indian, a Mormon boy who ran away from home to join the Indians (supposedly something kids did back then) as a teen he joined the Pony. The author: gives a geography lesson on the Great Salt Lake and desert; tells of Kit Carson and the mapping of the West; the 1849 Comstock Lode a "silver rush"; the Paiute Indian War which temporarily halted the Pony Express; even briefly covering the Donner Party and trail through the Sierra Nevada pass. Snow and cold, just another hardship the riders faced. Wells Fargo & Company ended up with the US mail route and the remains of the Pony service. The story ends with details of what happened to some of the Pony riders, station superintendents and the three partners. Some went on to success and long lives, others faced tragedy or died young. The story is fabulous and enjoyable to read. The author uses time period letters and articles which adds an old west ambience. It seems like everything one might want to know about the 1860s, the decades preceding it and those after, can be found here in this telling. The money details and troubles of the three partners can get a bit dull, maybe too much detail. Mostly it's a compelling story. My great-grandfather’s uncle, William Pridham, was a rider for the Pony Express. This is not a family legend, as are many Pony Express stories; he is listed in the Appendix to this book, which is a crisp, compelling story of the brief life of that once-iconic American enterprise. The family connection is really why I picked this book to read, and I was not disappointed in my choice. The author, Jim DeFelice (noted for earlier writing "American Sniper"), frames his book through describing the deli My great-grandfather’s uncle, William Pridham, was a rider for the Pony Express. This is not a family legend, as are many Pony Express stories; he is listed in the Appendix to this book, which is a crisp, compelling story of the brief life of that once-iconic American enterprise. The family connection is really why I picked this book to read, and I was not disappointed in my choice. The author, Jim DeFelice (noted for earlier writing "American Sniper"), frames his book through describing the delivery by the Express of the news of Lincoln’s election in 1860, following riders through their stations from St. Joseph, on the western edge of Missouri, to Sacramento. Interspersed with these evocative descriptions are narratives of the history of the Express itself, as well as of related historical matters, ranging from Bleeding Kansas to the development of portable repeating firearms. DeFelice is quite clear that a great deal about the Express is either conjecture or incompletely supported by the historical record. It ran for only eighteen months, it failed financially, and almost all written records were lost long ago. Even immediately after its time, it was surrounded by innumerable lies and myths, most famously those spun by Buffalo Bill Cody, and including the famous “Orphans Preferred” advertisement for riders. Still, it occupies, or occupied until recently, an outsized place in the American imagination. The Express was the brainchild of three men, already partners for several years in the business of Western transportation and distribution: William Russell, Alexander Majors, and William Waddell. Unlike many partnerships, where one partner does all the work and the others relax, it was one where each man actually contributed different talents. Majors was the boots-on-the-ground implementer; he organized and drove wagon trains. Waddell was the numbers man. Russell was the salesman, glad-hander and palm greaser, who in the end brought the whole partnership to ruin. The Express was not a standalone enterprise—it was conceived of as only one part of a plan to acquire extremely lucrative government contracts for mail and goods shipping. The partners knew the Express would lose money; they also knew that the cross-continental telegraph was imminent, and the railroads not far behind. Their plan was to, in today’s language, obtain the first-mover advantage, and position themselves to be the dominant, even monopolistic, players in the Western shipping business, profiting ultimately also from other income streams, such as land speculation if the railroads followed the routes they set up. Instead, they went bankrupt. Part of that was that the Express cost more, and brought in less, than even they expected. Consumers, as DeFelice notes, loved the idea of speed; they were less willing to pay for it. Speed was what the Express offered: ten days for a letter to California—at five dollars an ounce, when that was real money. But the bigger part was that the hoped-for government contracts never came through, for a variety of reasons. This destroyed the entire business plan. Moreover, the government welched on significant debts owed to the partners (as the result of damages suffered during the Utah War between the Mormons and the federal government). Russell, in a desperate attempt to keep the partnership afloat, thereupon engaged in a variety of shady schemes involving appropriation and hypothecation of government bonds he didn’t own, a fraud which when exposed put the final nail in the coffin of the Express. But its financial failure isn’t what Americans remembered. Nor was it just the speed that excited Americans of the time and later. As DeFelice notes, “the service and especially its riders embodied or symbolized some of the things they cared about: courage, physical prowess, the willingness to risk all in a race against Nature and Time.” In a refreshing departure from most modern popular writing, DeFelice wastes no time apologizing for these as virtues, or denying that these are masculine virtues, or caviling that women weren’t given opportunities, or “discovering” supposedly hidden women who played an important role. This was men’s work, and nobody pretended it was or should be otherwise, as we are forced to pretend today about everything from soldiering to breadwinning. So, because of its nature, the Express became an archetypal heroic narrative, with a distinctively American twist. Jordan Peterson doubtless approves, despite the dubious veracity of many of the specific stories about the Express. It is too bad that he is in the minority, and most of our ruling classes, if asked, would identify the Express as a shining example of “toxic masculinity,” among the stupider concepts of recent years (though it faces stiff competition from scores of others). Anyway, despite the dubious legends, the verifiable stories about the Express are plenty thrilling. Threats and challenges, including Nature most of all, were continually overcome by brave men. With the exception of the Paiute War, where they attacked and killed several riders and station operators, the Indians didn’t much concern themselves with the Express; primarily they were curious why the white man was in such a hurry. There were plenty of salty characters, though, including several, like the famous Jack Slade, who worked for the Express and did things like cut off a horse thief’s ears and nail them to a fence post to discourage imitators. Many of these characters were described by Mark Twain in "Roughing It," a book from which DeFelice quotes extensively (while noting that Twain frequently exaggerated and took artistic liberties in his descriptions). DeFelice does a good job of pulling his narrative along without undue credulity, and adding color with relevant historical data that ties it all together. 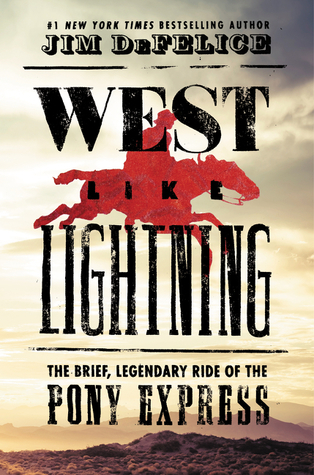 West Like Lightning is a fun, very entertaining look at the brief history of the Pony Express. While the Pony Express only ran for 18 months, it has lived on in myth and legend ever since it's first days. Jim DeFelice does a good job of presenting the story of the Pony Express, using the delivery of the news of Abraham Lincoln's election along the route of the Pony as the framework to talk about the people that built and operated the Pony Express, from the business men who thought up the idea, t West Like Lightning is a fun, very entertaining look at the brief history of the Pony Express. While the Pony Express only ran for 18 months, it has lived on in myth and legend ever since it's first days. Jim DeFelice does a good job of presenting the story of the Pony Express, using the delivery of the news of Abraham Lincoln's election along the route of the Pony as the framework to talk about the people that built and operated the Pony Express, from the business men who thought up the idea, to the riders and station masters who staffed the route. I found using this method of presenting the history of the Pony Express to be quite interesting as most histories are presented in a chronological order. What DeFelice does is use a geographic order (east to west along the route) and mixes up the chronology as he goes, jumping forward and backward in time to suite the narrative. It took a little bit to get used to, but was an effective tool for talking about the Pony. I did learn a lot about the Pony Express, and the period in 1860 and '61 when it was in operation. Learning that towns like St. Joseph, Missouri courted and provided incentives to the owners of the Pony Express to anchor the eastern terminus of the route - in the same way that cities today court large companies to build their factories or headquarters - was very interesting. Or how the Pony Express was never intended to ever be a money maker, or to last beyond the time it took to build the telegraph lines. That it had a planned obsolescence was quite interesting. Overall I recommend West Like Lightning. If you have any interest in American history, an interest in the Old West, or a look into how people dealt with the harsh conditions of moving across and settling the western part of the country, then you will enjoy Jim's look into the Pony Express. I'm going to round up and give this book four stars on Goodreads, but three and a half would be my final verdict. What I like the most about West Like Lightning is how the author covered a lot history around the short lived Pony Express to help give context. This information clarified what was happening in America around that time and the background of key people associated with this mail service. Keep in mind that Jim DeFelice went a mile wide but only a couple of inches deep in the topics that I'm going to round up and give this book four stars on Goodreads, but three and a half would be my final verdict. What I like the most about West Like Lightning is how the author covered a lot history around the short lived Pony Express to help give context. This information clarified what was happening in America around that time and the background of key people associated with this mail service. Keep in mind that Jim DeFelice went a mile wide but only a couple of inches deep in the topics that he discussed. The tangential details that stuck out to me the most was the brief overview of Mormon history up to the 1860's. The information presented was arranged geographically starting in the east at St. Joseph, Missouri and ending in San Francisco, California as the book follows the delivery of the news that Abraham Lincoln won the 1860 presidential election. Overall this structure worked well given the topic at hand, though peripheral subject matters could be a bit confusing since they weren't in chronological order. The author would jump around in the timeline to explain things as the location of the various points of interests showed up in his journey westward along the trail. There were only two things that bothered me during the course of this book. The first was the authors use of fictional style of writing to set up what the Pony Express rider in St. Joseph, Missouri might have been doing when waiting for the election results to be delivered. Writing what you imagine could have happened in a narrative style doesn't belong in a history book. If there isn't documented information, don't write as if it could have happened. Luckily, this style wasn't prominent and the 'tale' of the rider was only used to transition from one section to another. The other irksome aspect of this book was the author's propensity to use everyday speaking vernacular throughout the text. I love history books that take you on an enthralling (but factual) journey and are comprehensible. The rejoinders peppered throughout the pages detracted from the overall flow and felt sophomoric to me. Born April 3, 1860, died Oct. 24, 1861: The Central Overland and Pikes Peak Express Company, aka "The Pony Express." For a mere 18 months, during which the United States lurched toward dissolution, intrepid young men on fast horses riding between relay stations about 10 miles apart kept the west coast connected with the midwest and eastern states, transporting messages from the end of the telegraph at St. Joseph MO to Sacramento CA in 10 days across plains, deserts, and mountains. To tell the s Born April 3, 1860, died Oct. 24, 1861: The Central Overland and Pikes Peak Express Company, aka "The Pony Express." For a mere 18 months, during which the United States lurched toward dissolution, intrepid young men on fast horses riding between relay stations about 10 miles apart kept the west coast connected with the midwest and eastern states, transporting messages from the end of the telegraph at St. Joseph MO to Sacramento CA in 10 days across plains, deserts, and mountains. To tell the story of the Pony, author DeFelice traces the route of mail pouch carrying the news of Abraham Lincoln's surprising election in November, 1860. He describes the riders, the horses, the stations, the perils of marauding Native Americans, blizzards, bandits and horse thieves. He describes each of the Pony's districts and recounts the tales of the legendary characters such as Jim Bridger, Buffalo Bill Cody, and Wild Bill Hickock. We learn about Samuel Colt, inventor of the revolver, Samuel Morse and the telegraph, and Joseph Smith and the Mormon pioneers. A major emphasis is on the Pony's doomed business plan and shaky financing and how it eventually led to Wells Fargo and the extension of express service and later the railroads throughout the west. A lively read about the Pony Express. It's amazing how something that was so short-lived has become such a romanticized, mythologized presence in American history. This was a very enjoyable read though, after I finished reading it, I didn't feel as if I walked away knowing much more about the Pony Express than before I started. There's a lot of information in the book, but much of it is focused on the other events going on in the country at the time- especially the Civil War (and the beginnings o A lively read about the Pony Express. It's amazing how something that was so short-lived has become such a romanticized, mythologized presence in American history. This was a very enjoyable read though, after I finished reading it, I didn't feel as if I walked away knowing much more about the Pony Express than before I started. There's a lot of information in the book, but much of it is focused on the other events going on in the country at the time- especially the Civil War (and the beginnings of the Mormon church and the founders' move from Missouri to Illinois to Utah). It also spends quite a bit of time discussing some of other personalities of the time that were loosely tied (or not at all) to the Pony Express, including Wild Bill Hickok and Buffalo Bill Cody. Although there is a notes section, it is included at the end of the book instead of cited within the text or placed at the bottom of the page as traditional footnotes. Some of the information left out of the text and placed into the notes should have (in my opinion) been kept as part of the text. It would have kept the book on its main topic and made it easier for the reader to see that information. I learned a lot from reading this book--I didn't realize how short-lived the Pony Express was, and how it fit into the context of the times. It took me a while to catch on to how DeFelice was approaching the book: not chronologically but instead by telling stories of the stops along the route. That's an interesting way to tell the story, but it made the book somewhat hard to follow. Early in the book, Lincoln has been elected, then later he hasn't, and then he is again . . . the book doesn't fol I learned a lot from reading this book--I didn't realize how short-lived the Pony Express was, and how it fit into the context of the times. It took me a while to catch on to how DeFelice was approaching the book: not chronologically but instead by telling stories of the stops along the route. That's an interesting way to tell the story, but it made the book somewhat hard to follow. Early in the book, Lincoln has been elected, then later he hasn't, and then he is again . . . the book doesn't follow a strict timeline which was somewhat confusing and also led to some repetition. There were several times he told a story more than once or "introduced" a character that we had already met. The only thing this author does succinctly is refer to the pony express as “the pony.” He presents information like a terrified drunk with a shotgun—there’s no telling where or what is coming next. If he kept to the information actually related to the pony express, the book would be a fraction of the length. Certainly, DeFelice has a huge enthusiasm for the old west. Had he only retitled the book to focus on a broader theme, expectations would have been better met. As it stands, it’s too hard to The only thing this author does succinctly is refer to the pony express as “the pony.” He presents information like a terrified drunk with a shotgun—there’s no telling where or what is coming next. If he kept to the information actually related to the pony express, the book would be a fraction of the length. Certainly, DeFelice has a huge enthusiasm for the old west. Had he only retitled the book to focus on a broader theme, expectations would have been better met. As it stands, it’s too hard to follow the historical storyline. The legends interspersed among the facts further muddle the story, especially when they are not explained as untrue until after being told. This book is uneven. I picked it up because I have a newfound interest in California/Western history. It tells about the Pony Express both from a factual basis and as a myth. Lasting only 1 1/2 years, the stories of the brave young men dashing across the American outposts to deliver mail were told and retold til they reached epic status in the late 1800s. The author tries to do a lot in this book - tell the background story of the business elements of the Pony Express, set it in the context of t This book is uneven. I picked it up because I have a newfound interest in California/Western history. It tells about the Pony Express both from a factual basis and as a myth. Lasting only 1 1/2 years, the stories of the brave young men dashing across the American outposts to deliver mail were told and retold til they reached epic status in the late 1800s. An interesting account of the short, happy and eventually demise of a truly American legend of the Pony Express.The young men who rode across the untamed west from St. Joseph Missouri to San Francisco, California and made it in spite of weather, dead end trails and of course Indian's ( not much though as the westerns of fiction, movies and television would later protray). The stories of the riders, the wannabe's and the businessmen are all depicted, whether they spun the tales of riding or not. B An interesting account of the short, happy and eventually demise of a truly American legend of the Pony Express.The young men who rode across the untamed west from St. Joseph Missouri to San Francisco, California and made it in spite of weather, dead end trails and of course Indian's ( not much though as the westerns of fiction, movies and television would later protray). The stories of the riders, the wannabe's and the businessmen are all depicted, whether they spun the tales of riding or not. Buffalo Bill Cody, himself might have done some work for the Pony, but his claim to fame was to bring back the stories into his Wild West Show in late 19th and early 20th centuries, to spur the imagination that still lives with American's today. Right away, one of the most amazing facts about the legendary Pony Express is that it lasted a mere 18 or so months. And another of the most amazing facts is that it was intended to exist only a short time. The Pony Express ran mail from St. Joseph, Missouri, to Sacramento, California. But it was only a demonstration for the men who started it. They really wanted a normal mail contract from the U.S. government, and the Pony, as it was called, was a way to show that they could deliver the mail. The Right away, one of the most amazing facts about the legendary Pony Express is that it lasted a mere 18 or so months. And another of the most amazing facts is that it was intended to exist only a short time. The cliché of only single young riders was just that, something added after the Pony was over, as was most of the legend. For example, the one man who did more than anyone to burn the Pony Express into the consciousness of the nation, Buffalo Bill Cody, likely never rode it. But his Wild West show helped turn it into a Western legend. The author uses the device of the 1860 presidential election to tell his story with aplomb and humor. He recounts the stories, legends and tall tales as we follow the news that Lincoln had won all the way from the East to the West just a few days later, which was a revelation. Just months after opening, the telegraphs came along – and there was a telegraph station that the Pony delivered to, in fact. As the Pony wrapped up, the telegraph took over, and the men who started the Pony had their hand in the transcontinental railroad, too. This is a fun, fast-moving story and a must if you’re interested in the stories of the Wild West. This book was won from Library Thing. The best history writing has a good narrative hook. They pull you into the lesson. This does not. I found ‘West Like Lightning’, dry. DeFelice reminds us (many times) that little is known or documented about the brief 18 month life of the Pony Express. There is a lot of ‘this may or may not be true’. As filler we get, some interesting background on the period. Buchanan’s failed presidency, Lincoln’s election and inauguration, the ongoing political/moral issue of slavery, and the imminent war. 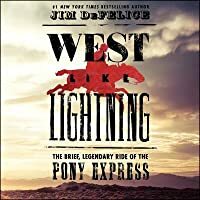 West Like Lightening is Jim DeFelice's account of the Pony Express. Running from St Joseph Missouri to Sacramento California the Pony lasted only 18 months from 1860 through 1861. But it's heroics and reliability were lionized in Buffalo Bill's Wild West shows. An iconic image in American myth of the old, Wild West. Good read. My latest book, CODE NAME: JOHNNY WALKER was hailed by Kirkus Review as a “fiery, insightful memoir from the former Iraqi translator who fought alongside U.S. Special Forces during the recent war in Iraq.” They also “a harrowing personal journey of courageous self-empowerment during wartime.” called it an “invaluable insider’s perspective of Iraq. I wrote it with the real "Johnny Walker," who was b My latest book, CODE NAME: JOHNNY WALKER was hailed by Kirkus Review as a “fiery, insightful memoir from the former Iraqi translator who fought alongside U.S. Special Forces during the recent war in Iraq.” They also “a harrowing personal journey of courageous self-empowerment during wartime.” called it an “invaluable insider’s perspective of Iraq.